I continue to recommend buying. Commitments of Traders is a weekly report which provides an actual head count detailing how different types of traders are currently positioned in the futures markets. The figures are taken straight from the exchanges, and in its most simplified form, the COT gives you a weekly snapshot of the total long and short positions held by the three primary classes of traders involved in trading futures: Commercial Hedgers, Large Speculators (funds) and Small Speculators. Although there is no indicator that even begins to approach being infallible in predicting markets, my experience has been there are very definitely times when it pays to note when Small Specs are heavily on one side of a market, my logic (and experience) being, these are the guys most likely to be wrong in this Mob Psychology Game…or more specifically, if this crowd of sheep is heavily short a market, I prefer to be long…and vice versa…which is now precisely the case in Treasury Bonds and Treasury Notes, where these generally wrong way traders are heavily short these two interest rate markets in which I am currently anticipating very strong rallies. First up…Ten Year Notes…This is the contract you see and hear all the TV Yapheads talking about…and wrongly predicting all the time. And Treasury Bonds…Less talked about by the TV guys but this IS the Big Mama in interest rate futures…Again, nothing about any of this can be considered an absolutely reliable indicator, but as I have earmarked on the chart, there have been numerous occasions when overly short small speculative positions have directly coincided with major bond market bottoms. I am quite comfortable in saying, “I think the whole world is short this market”. Seemingly 99% of the YakYak TV guys will assure you that Bonds have no place to go but down…that “Interest Rates gotta go up!”…and I strongly believe, they have it as ever-backwards as they always do. 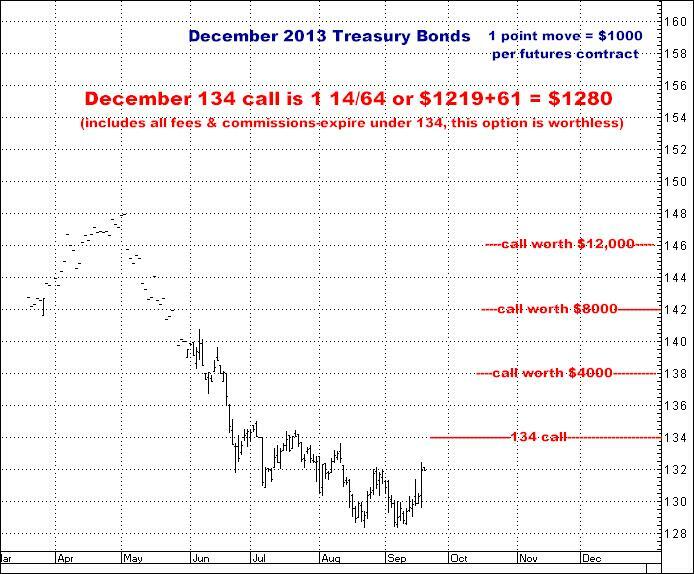 I THINK TREASURY BONDS HAVE NOWHERE TO GO BUT UP. I think this planet is brimming with buyers of US Treasuries…the safest piece of fixed income to be found anywhere…whether the Fed “tapers” or not. I think inflation, the only thing I believe could truly push rates higher, is still the insignificant factor it has been for 30 years. I think the demographics of the baby boom (a world-wide phenomenon) means hoards of fixed income (bonds) buyers for decades to come. I think rates will remain relatively low for the foreseeable future, NOT because I think in terms of low rates being needed due to a “slow economy”, but simply because rates don’t NEED to go up. They can stay here, at levels, that were relatively NORMAL prior to the mid to late 1970’s. As I have written off and on for years, I think the globe is in the midst of a giant BOOM, generated by the Technology Revolution and the Death of Communism (with its concurrent unleashing of several billion new capitalists and consumers)…and the HIGHER all the equity markets of the world go, the more funds there will be that become available to invest in fixed income. And finally, we take it for granted today, but it was only in 1980 that the US Government, for the first time in the history of man, pretty much MANDATED that individual employees should ever thereafter INVEST SOME PORTION OF EVERY PAYCHECK IN SOME PIECE OF PAPER…and when you get down to it, other than putting those IRA funds in a money market (cash), there are only two other major choices, Stocks and Bonds…The point is, THERE ARE ENORMOUS FUNDS, EVERY DAY, EVERYWHERE IN THIS COUNTRY (AND OTHERS AS WELL), THAT REPRESENT POTENTIAL BUYERS OF STOCKS AND BONDS…AND THIS IS NOT GOING TO CHANGE. GOVERNMENT MANDATED INVESTING IS HERE TO STAY. No, this does not mean both of these asset classes won’t have periodic downswings, but it does mean, I believe, that any of those downswings, WILL, at some level, find enough solid (unending really) buying to push them back up…And with Treasury Bonds now having backed up 20 points, I think that is exactly where we are. 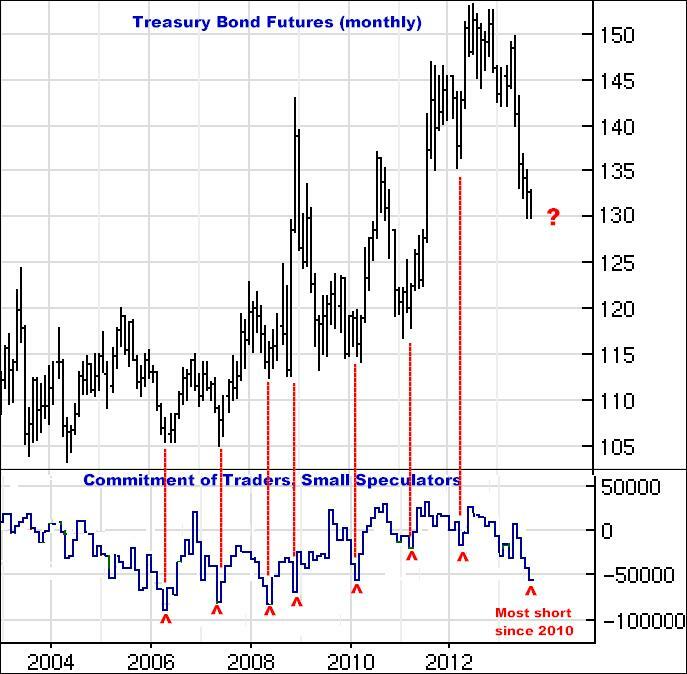 IT IS TIME TO BUY TREASURIES HERE (not short them like all those market fodder small specs are doing). I TRULY LOOK FOR THEM TO BE 15-20 POINTS HIGHER BEFORE WE GET TO 2014. Treasuries rallied almost 2 points ($2000 per futures contract) today…Having traded this market more than any other for the past 30 odd years, I can tell you it would not be a surprise to see them be 4-5 points higher within the next week or so…No, I’m not sitting here screaming, “Here they go!”, but there are a TON of shorts in this market…and I really cannot count the times I have seen them looking, and feeling, just like they do now…and another 4 to 5 immediate upside points, is, I believe, a VERY strong possibility.